The Connecting Country community is deeply saddened to learn of the recent passing of Ern Perkins. Along with wife Lesley, Ern’s efforts to discover and document the flora and fauna of Castlemaine and surrounds over a period of more than 40 years are legendary. The findings of this research have formed the basis for so much of our knowledge about the local environment. He was passionate about making this information available to the general public. Ern mentored many local ecologists, and was a great believer in using rigorous scientific survey methods. He was a great supporter of Connecting Country, and regularly provided advice on plant species identification and occurrence. He was also involved in many other local groups including Friends of Kaweka, Castlemaine Field Naturalists Club, FOBIF and Castlemaine Landcare. Development and maintenance of many brochures on the identification of plants and animals of the local area, as well as brochures on local sites to visit. Many of these brochures are available at the Market Building and Goldfields Library. Dozens (if not hundreds) of articles published in the Castlemaine Naturalist newsletter. He was awarded an OAM in 2000 for Services to Conservation. 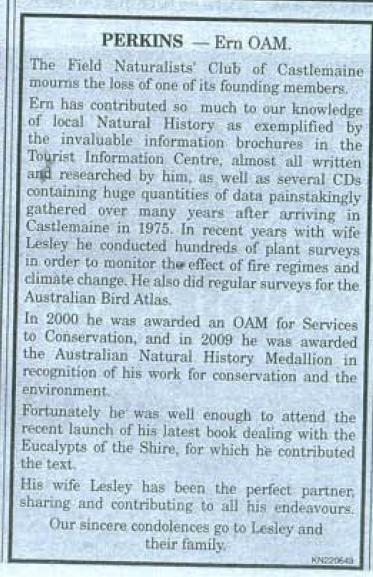 In 2008, Ern was awarded the Australian Natural History Medallion, which is awarded annually to the person judged to have made the most meritorious contribution to the understanding of Australian Natural History. In late 2015, his local contribution was recognised with life membership of the Castlemaine Field Naturalists Club. He is an inspiration to the staff of Connecting Country. We send our condolences to Lesley and family. He has established a legacy that everyone with an interest in the local environment will need to work together to continue. (Follow these links to read messages from the Castlemaine Field Naturalists Club and Castlemaine Landcare – as published in the Castlemaine Mail newspaper on 11 Nov 2016). Ern (on right) at the launch of his Grass Identification CD in 2012. 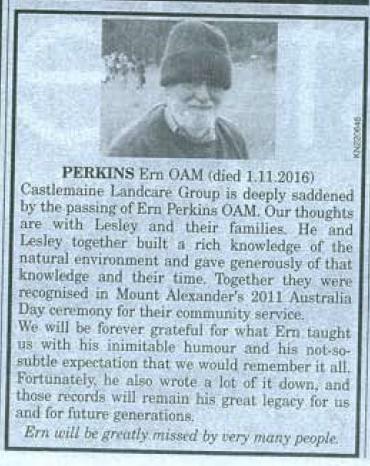 To the people of the Mt Alexander region, I knew Ernie Perkins from when I was I was a student at the High School, starting 40 years ago. I grew up in Castlemaine but left when I was in my late 20’s. I have been a member of the Castlemaine Field Naturalist Club for the last handful of years to keep in touch with the bush I loved. I really respected what Ern had done and was doing and would have appreciated telling him that maybe he had some influence on me. I’d like to think he’s on Mt Alexander.